NETWORK FINALS: Game 2 of the NBA FINALS adjusted to 6.5, and the pre-game JIMMY KIMMEL LIVE adjusted to 1.0. In addition, the MISS USA PAGEANT gained 0.1 after adjustment. Elsewhere, the AMERICAN NINJA WARRIOR rerun and the 9PM MADAM SECRETARY rerun each rose 0.1. CABLE HIGHLIGHTS: The good news for AMC was that PREACHER held up beautifully with a 0.10 dip to 0.80, considering that it was returning from a week off, didn’t have FEAR THE WALKING DEAD as a lead-in, and had to face GAME OF THRONES directly. The less good news was the unimpressive 0.31 launch for FEED THE BEAST, which will have no lead-in at all when it moves to Tuesday tonight. At HBO, GAME OF THRONES itself recovered almost entirely from last week’s Memorial Day weekend dip, up 0.70 to 3.95, which put it just a tick below its airing 2 weeks ago. SILICON VALLEY was up 0.03 from last week to 0.91, VEEP rose 0.08 to 0.51, and LAST WEEK TONIGHT, which didn’t air last week, had an impressive 0.15 bump from 2 weeks ago to 0.72. Showtime’s HOUSE OF LIES gained 0.04 to 0.13, and PENNY DREADFUL was up 0.03 to 0.23. Starz’s THE GIRLFRIEND EXPERIENCE was once again off the chart, steady at 0.03/177K. 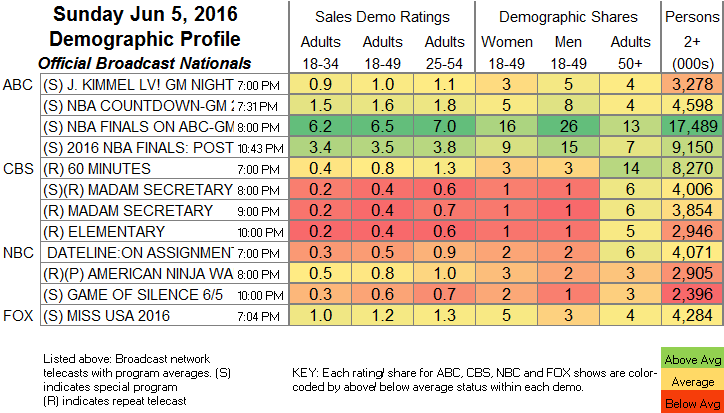 Disney Channel’s GIRL MEETS WORLD was at 0.56, with lead-in LIV & MADDIE at 0.48. On Adult Swim, MIKE TYSON MYSTERIES lost 0.05 to 0.46, and MR PICKLES fell 0.14 to 0.34. Hallmark’s GOOD WITCH rose 0.04 to 0.27. USA’s MOTIVE ticked up to 0.21. The unscripted evening was led by E!’s KEEPING UP WITH THE KARDASHIANS, up 0.08 from 2 weeks ago to 0.81, with lead-out RICH KIDS OF BEVERLY HILLS up 0.03 to 0.28 (from last week, when it didn’t have a full KARDASHIANS lead-in). Discovery’s NAKED & AFRAID was up 0.08 from 2 weeks ago to 0.79. 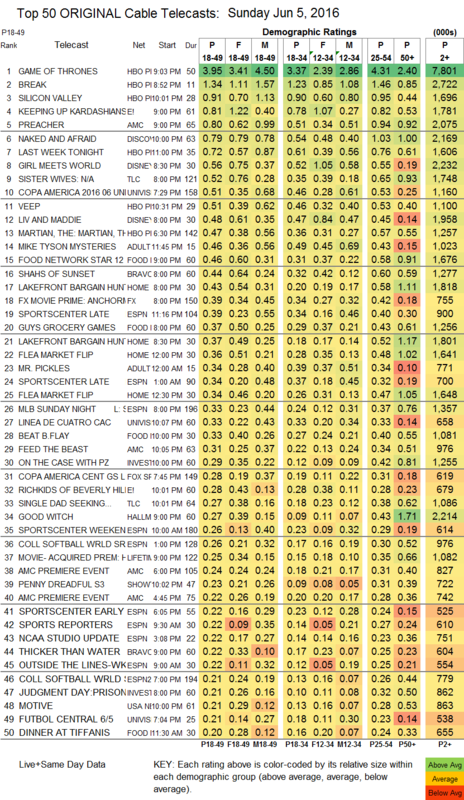 On TLC, a 2-hour SISTER WIVES was up 0.12 to 0.52, and SINGLE DAD SEEKING was steady at 0.27. On Food Network, FOOD NETWORK STAR rose 0.03 to 0.46, GUY’S GROCERY GAMES gained 0.05 to 0.37, and BEAT BOBBY FLAY was at 0.33. Bravo’s SHAHS OF SUNSET edged up 0.02 to 0.44, but THICKER THAN WATER lost 0.02 to 0.22.